In short, I’m worried TextMate is effectively “abandonware”, and abandonware is a liability. A serious break or bug can force a switch to another tool right in the middle of a work project, a huge risk and time sink I didn’t want to undergo. That concern gave me the motivation I needed to consider TextMate alternatives. Two editors stood far above the others in terms of their feature set for my needs and developer support: BBEdit and Sublime Text 2. I first expected BBEdit, one of the most venerable Mac editors around, to be the obvious TextMate successor. First, it’s well established on its 10th version and affordable at $40. In addition, a large number of developers I respect made the TextMate to BBEdit switch in the past few months. Yet after a month of use, BBEdit started driving me crazy: It has a side drawer for file storage I never got use to. I hated how a keyboard press didn’t do automatic code indenting or auto completion the way TextMate did. The syntax highlighting never felt as comprehensive as TextMate’s. The BBEdit equivalent of TextMate’s extremely useful find file tool wasn’t available; an extra $10 third party utility felt like an unsatisfactory compromise. That lead me to Sublime Text 2, a comparatively newer, cross platform editor that I hadn’t heard of until its version two beta started generating a lot of positive buzz on Twitter. Like with BBEdit, I first ran into some problems such as, user preferences are set in text files, not menu options. Though I’m comfortable with Unix, Sublime’s setup makes for an annoying and mildly intimidating hurdle to overcome. I also find multi file searches, handled in Sublime Text as little more than a Unix style grep, weak in comparison to other text editors. 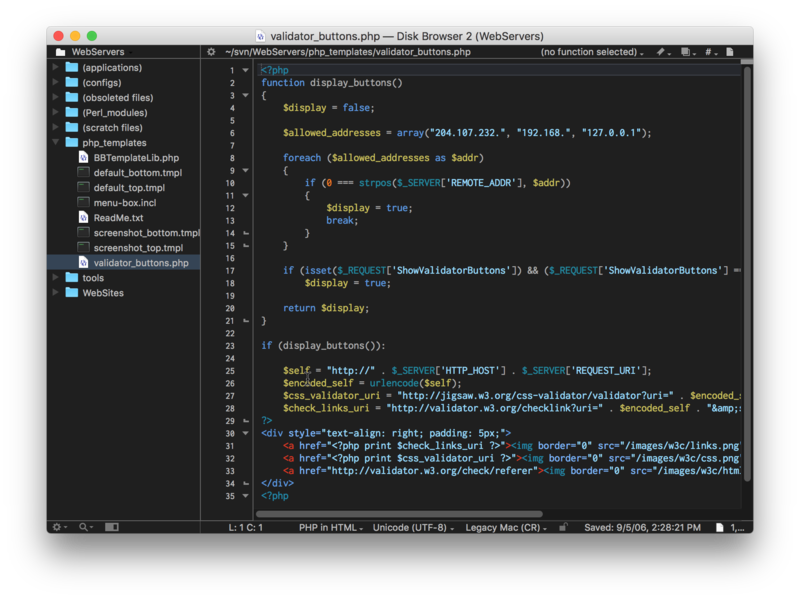 Overall, Sublime Text 2 is exactly what I’m looking for in an editor; it combines the speed, minimalism and low footprint of the classic Unix editor Vim with the added toolset and functionality of a more full featured, TextMate style text editor. It may not be for everyone, but it comes highly recommended, well worth the $59 sticker price.